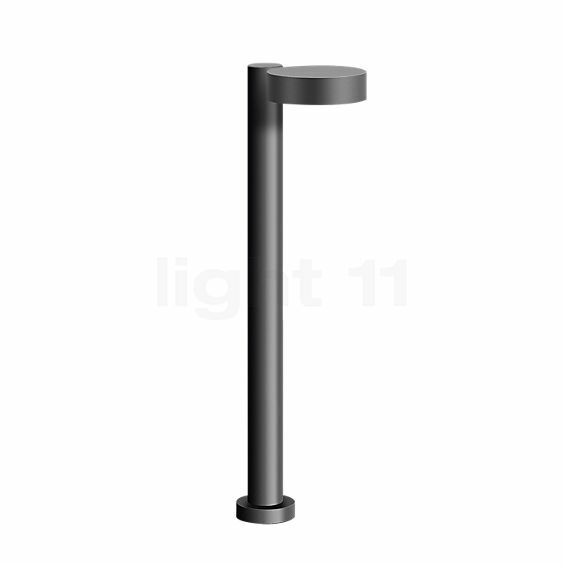 Subtle, stylish, serious: the Bega 77221 bollard light LED is another prime example of the restrained, tasteful design, the high-quality workmanship and the finely selected materials for which the German manufacturer from Menden is known. The slender exterior light, whose base, shaft and lamp head use the geometrical shape of a circle to form a harmonious unity, is kept in discreet colours. It is manufactured from cast aluminium, aluminium and stainless steel. The light opening of the 77221 bollard light LED is covered by a clear, impact-resistant sheet of polycarbonate that has a special surface structure for a glare-free light emission. In addition to its discreet, stylish appearance, the Bega 77221 bollard light LED scores points with an impressive lighting effect. The exterior light made in Germany distributes its light in a wide rectangle. The specially textured polycarbonate cover ensures a completely glare-free downward light emission. This results in a particularly soft and uniform illumination of ground surfaces, which is furthermore highly economical thanks to an energy-efficient LED module. For a safe outdoor use and long service life, the 77221 bollard light LED is produced according to protection class IP 65, which means that it is dust-tight and takes no harm from jet water coming from any direction. The bollard light is supplied with a mounting plate required for bolting it onto a foundation. Tell other customers and us about your experiences with the 77221 - Bollard light LED ! The Bega 77221 bollard light LED is suitable for many different application in the outdoor area. Garden paths or entrance areas are skilfully illuminated, which increases orientation and safety. A driveway, as well, benefits greatly from the bollard light’s uniform ground lighting, as it reduces the risk of accidents by helping you to detect possible obstacles early. Furthermore, the Bega 77221 bollard light LED may be used to mark and accentuate a pond, making it stand out prominently from the rest of the garden.